You don’t need to invest in an expensive home alarm system or install an unsightly barbed wire fence to keep out burglars. Sometimes a couple easy steps are all you need to secure your home. 2. Always remember to remove flyers from your doorstep – Never let flyers or menus build up on your doorstep — you risk appearing like you’re on vacation. And if you are on vacation, have your neighbor pick them up for you. 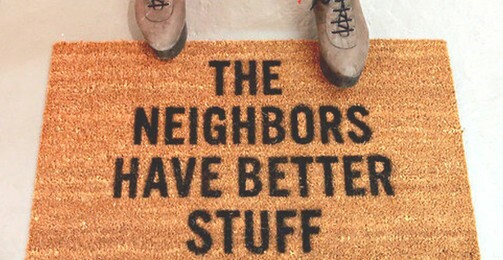 Burglars sometimes case a home by planting a flyer and checking to see if someone picks it up. 3. Put bumper stickers on your car – Anything that makes your car more easily identifiable is a good deterrent. And remember to keep it messy if you can. 4. Keep your landscaping neat and trimmed – Eliminate any potential places for burglars and intruders to lurk. Be sure to keep large bushes and shrubs away from windows. 5. Buy light timers for your indoor and outdoor lights – Use fluorescent bulbs to keep energy costs down. 6. Pretend like you’re saying good-bye to someone inside when you leave your home – If someone’s watching you, they’ll be fooled into thinking someone is still home. 7. Don’t leave your electronics boxes out on the curb – Drive them to the recycling plant yourself, or cut them up into smaller pieces and conceal them in your recycling or trash bins. 8. Don’t leave a ladder just hanging out in your backyard – Most burglars don’t BYOL. So don’t make their jobs easier by supplying them with an easy way to get into your bedroom. 9. Make sure that your mirrors don’t reflect your home alarm – Burglars might be able to see if your alarm is unarmed, so make sure you examine your mirrors from all outside angles. 10. Mow your law – People will wonder if you’ve gone on vacation if you let your grass grow too high. 11. Don’t leave status updates broadcasting that you’re away. 12. Fake a TV glow – This little gizmo uses the same energy as a nightlight, works on a timer system, and makes it look like someone’s home. It costs $39.99. 13. If you go out of town, have a neighbor leave tracks in the snow – Untouched, virgin snow is a surefire way to let burglars know that no one’s home. 14. Buy some fake alarm system decals if you can’t afford a real one – Ebay has got plenty of these. 15. Load your car in the garage with the door closed. If you have to do it in public, do it as quickly and efficiently as possible. 16. Reinforce your door jambs if you have weak door frames – Keep your doors from getting kicked in with this supremely easy DIY, which takes under an hour to install. 17. Cancel your newspaper subscriptions and ask the post office to hold your mail while you’re out of town – An obvious build-up of materials will let everyone know no one’s home. 18. Use a wooden dowel or metal bar for sliding doors and windows so they can’t be pried open – Cut a wooden dowel so that it fits into your track when it’s closed. 19. Invest in double glazed or toughened glass windows – Double-glazed windows as well as toughened glass are harder to smash through. Not the cheapest option, but you get added benefits. In the case of double-glazed windows, you’ll save money from increased heat insulation and they’ll block out more noise, which could increase your property value if you happen to live on a loud, busy street.